Even though its late March and most teams don’t start climbing Everest until mid-May, there are multiple story lines developing for this 2019 spring season. Let’s review a few that I’ll be following closely and reporting on often. I already did a post of a few climbs that are out of the ordinary for this season. They include a new route attempt on the Tibet side, Kami Rita going for another record number of summits, Nirmal Purja trying to summit all fourteen of the 8000ers in seven months, Nima Doma Sherpa, and Furdiki Sherpa attempting to summit in honor of their husbands who recently died on Everest, and South Korean Hong Sung Taek who is back on the south face of Lhotse for the fifth time. I’ll be following all of these climbers and a few more whom I’ll introduce in the weeks ahead. Last year was a record year for Everest summits with 802 total summits. The previous record year was in 2013 with 670 total summits by all routes. Tragically, last year, there were the usual number of deaths with four on the Nepal side and one on the Tibet side. 2019 is shaping up to approach 1,000 summits from all routes, all climbers. I’m estimating that on the Nepal side we can already identify 350 members with 340 Sherpas and on the Tibet side 185 members with 150 Sherpas. This totals 500 members with 590 support climbers (Sherpas, Tibetans, guides, etc.) or 1,090 people attempting to summit the world’s highest peak. I fully expect these numbers to grow by 10% to 25% when the climbing begins in mid April potentially exceeding 1,200 people! With this many people, contrary to what the national media will use as bait-click headlines, I don’t expect to see significant delays like we once had, especially in years like 2006 and 2012. Why? The Everest climbing community has become better at managing the large number of climbers. Guides coordinate better amongst themselves, and weather forecasting continues to improve. But delays can occur if the weather acts up. The nightmare scenario occurred in 2012 when harsh weather shut down the rope fixing and summits attempts for weeks on end. There were only four days, instead of the normal average of eleven, that were suitable for a safe summit attempt. When teams were brave, or frustrated enough as time was running out, to go for the top, they experienced horrible delays of long lines and backups at the usual spots of the 2nd Step and Hillary Step. At the other end of the weather extremes was last year, 2018, when climbers on both sides experienced an unprecedented weather window of 11 straight days that enabled a record number of summits. Everyone is hoping for a repeat but there are warning signs it might not happen. This is always the wildcard in anticipating big mountain climbing issues. On K2 and Nanga Parbat this winter they experienced constant high winds and deep snow. And there are some indicators that our Everest/Lhotse climbers might want to heed. During the winter of 2018/19, Nepal saw an increase in the number of “snowfalls” with 24 from the previous record in 1975 with 15. source. Kathmandu, perhaps the canary in the coal mine, reported snow on February 28, the first snowfall since 14 February 2007! Another datapoint is this past winter, India saw a 24% increase in rainfall compared to the normal. source The last time this happened in India was in 2013. That year Everest expeditions experienced delays that lasted into the second half of April due the extreme cold and heavy snow. The rope fixing teams on both sides were delayed until May 17 instead of getting to the summit by late April. To add a bit of fuel to this speculative fire, using the rain in India as an indicator, in the last 24 years, only once did India receive more winter rainfall than in 2018/19 and that was in 2005. That was also a difficult year on Everest with the first summits on May 21 that proved to be the latest in 45 years of climbing Mt. Everest. Norgay and Hillary did it on May 29. How all of this historical data and 2018/19 winter rain and snow will translate to snow conditions on Everest is unknown. We will have our first clue when the rope fixing teams reach the North and South Cols in early May. If it looks like a season with heavy weather and few summit days, the smart teams will push hard to get their acclimatization in as soon as possible and be in position to take advantage of any summit window that emerges anytime in May. As an aside, this is an outstanding article written by Gloria Dickie on the site ensia.com on how climate change is impacting the nomadic culture of the Tibetan yak headers and how they are providing data to help researchers. Well worth the read. As has been the trend, the middle-class in both China and India are coming in droves to Everest, especial on the Nepal side. This shows how mountain climbing is attracting new fans and increasing the traffic on the world’s biggest peaks and providing more business for the guide services. In that sense, China, fearing a runaway has put perhaps the strictest requirements of any country with one of the highest or most famous peaks. If you are a Chinese national, you must have summited an 8000-meter peak before attempting Everest from the Tibet side. This single requirement is the reason the Nepal operators are guiding more and more Chinese clients each year. Thus far, not surprisingly, they have proven to be strong and up to the task of climbing Everest. Some Nepalese guides have focused on this lucrative market as the Chinese appears to be not as price sensitive as other nationalities. Adding to this Nepal push is a limit China put on member permits for 2019 at 300. However, given the most member permits ever issued was in 2007 at 197, this is really not an issue in my opinion but it gives the appearance that China is managing Everest better than Nepal. Likewise, the teams from India are growing rapidly. Transcend Adventures specializes in training young (under 20) Indians back home then taking them in a highly supported effort to the Tibet side. They have put more than 60 young Indians on the summit of Everest in recent years. And the Indian Army is back on the Nepal side with their usual team of 20 to 30 members, plus support. They are one of the larger teams that has traditionally moved slowly and created delays. At the other end of the nationality spectrum, the traditional countries that fueled the Everest explosion the last 20 years are slowly fading away. Climbers from Western Europe, the US and AustralAsia are slowly becoming the minority. A trivia point as long as we are talking about nationalities is when looking at ages of who has summited Everest, in 2010 the age group from 35 to 39 had the most summits with 51 and last year it had shifted to 40 to 44 at 76. In other words the average age of an Everest summiteer was five years older. The average age over the past three years was 41 compared to the last three years in last century was 37. Another trend that has been developing the last few years is a new generation of foreign guides. While the market for Americans, Brits and Germans is slowing, the old guard guides are shedding their most senior leaders to these new companies. Alpenglow, Furtenbach, Madison, Climbing the Seven Summits and others are growing quickly and this year will guide more clients than their “parents” of Alpine Ascents, International Mountain Guides, Himalayan Experience and others. As is the norm in business the old guard is hesitant to change a model that works for them thus allowing new entrants to offer new ideas that attract new customers, and even some of their old customers. Another long term trend I started talking about in 2014 is the emergence and dominance of Sherpa owned and operated guide companies. No other company than Seven Summits Treks personifies this trend. For the last few years, they have had close to 100 members on their Everest team and have diversified their offering from extremely low cost ~$20,000 for the price sensitive to catering to the ultra wealthy market with their VVIP package at $120,000. While they have had some mishaps, based on their number of summits they are well within the norm of the old guard. One fly in this web of growing climbers and new guides is the lack of qualified Sherpas to support the climbers. 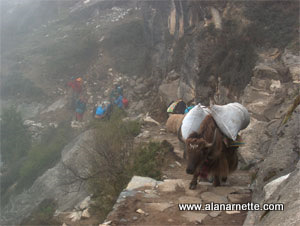 It has almost become the norm for each climber to have a personal Sherpa from base camp to the summit. Bottom line is that there are not 600 Sherpas/Tibetans that are qualified to support 600 members, many not qualified or experienced to be on Everest at all. This is the disaster waiting to happen. If we have a difficult weather year and operators, feeling the pressure to get clients to the summit, push in difficult weather, the support systems available are simply not in place to handle a mass number of emergencies. If this happens one day, it will be the inflection point in the never ending lure of Everest. I hope its not this year. Finally, there has been a lot of press about the scams involving guides, helicopter companies, hospitals to cheat evacuation companies out of hundreds of thousands of dollars with fake or duplicate rescue claims. This has turned into a circus with a small group of insurance companies represented by an aggressive broker leading the charges. The Nepal Government did an inquiry last summer and found some problems and promised changes, but as usual nothing of substance has occurred. Some of the longtime evacuation companies feel this is not a big issue due to their professional approach and will continue to serve their clients. But, this is an emerging story that warrants keeping an eye on. If you are trekking or climbing Everest, or anywhere in Nepal this spring, double and triple check with your evacuation company that your guide is not on a “bad” list otherwise you may end up on the hook for thousands of dollars even if you really needed that chopper flight out. My best to all the climbers regardless of your guide, or route. Climb Safe, be aware, be smart and get back home to the people who love you. I’ve been following your blog for years and look forward to this seasons reports! Alan – as always, great posts on the blog about the climbing season on Everest and I can’t wait to read more as the season progresses. I feel that the Everest crowds will continue to grow and grow until something bad happens that makes Nepal and/or China change their rules for obtaining a permit to climb. I know a lot of the “western” guides have prerequisite before you can apply or climb Everest, however, on your trips to the mountain, did you see the lack of qualified climbers either in your group or other groups? I’m just wondering if the almighty dollar is being put in front of safety of the climbers (including the safety of those with experience but might be put into a bad situation by those around them that have no clue about what they are doing). Interested to hear your take. Thanks Alan – always great to hear your opinion and thoughts on Everest and mountaineering! Alan, For 3 years in a row , I have come to depend on your blog as the source of information and truth for all that is exciting about and around the mountains . Thank you ! With an estimated 1000 climbers and a potential of a shortened weather window of let’s say 6 days , we are talking about 165 summit attempts a day . My question is how do the expedition leaders of 165 climbers co ordinate each day of summit push and agree amicably ? If it was “only” 165 that would be no problem. In all seriousness, Everest is a big mountain. Throughout the past decade there have been many, many 200 person summit days – most with little to no significant issues. Always look forward to this time of year and your great blog when working offshore. Helps the quiet night shifts pass and always interesting to see what is going on the other side of the world. Keep up the fantastic work Alan and look forward to following you for the next few months. Awesome update Alan. You are the best. Every time I read your update I’m transported back on the mountain. Your blog is simply the best! Thank you for sharing the passion it takes to bring such detail to us lucky to have found your writing. Does the increase in “snowfalls” increase the risk of avalanches? Usually avalanches are not a big issue on Everest. They occur occasionally off route near the North Col and rarely on the Lhotse Face. Summit Coach is a consulting service that helps aspiring climbers throughout the world achieve their goals through a personalized set of consulting services based on Alan Arnette’s 25 years of high altitude mountaineering experience and 30 years as a business executive. Why Do You Need a Coach? If you are looking for help with selecting the best guide, buying gear at the lowest price or avoiding surprises on your climb, Summit Coach is for you. I lost my mom and two aunts to Alzheimer's. Please join me to end Alzheimer's by joining the fight! Read the details. Which mountain would like to clmb? Contact me to be added. • What is Wrong with Everest? Dreaming of climbing mountains but not sure how to start or reach your next level from a Colorado 14er to Rainier, Everest or even K2? Summit Coach is a consulting service that helps aspiring climbers throughout the world achieve their goals through a personalized set of consulting services based on Alan Arnette’s 23 years of high altitude mountain experience and 30 years as a business executive. Please click for more information on signing up, services, pricing and why select Alan as your coach. Alan Arnette is the oldest American to summit K2 in 2014 and has 6 expeditions on Everest or Lhotse with a summit of Everest in 2011. He climbs to raise money and awareness of Alzheimer's disease. His Project 8000 is to climb the 8000 meter mountains he has not summited over the next 5 years.